Property 43: Forte Sorgnano with Castle,apartments, restaurant, area relax and farm! Property 49: Farmhouse holidays in Umbria, the green heart of Italy, amongst art and nature. What's not to love about this jewel? It's hard to imagine a better place to stay in Spoleto. 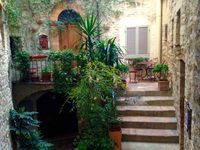 Belle-Due is beautiful, elegant, in a great central location, tucked away off Corso Garibaldi. It has large warm rooms, everything spotless and welcoming, with a terrace and views of the town and the mountains. Laurie and Norma are friendly and attentive.